The dark histories of some of the shiny items adorning our bodies has been popularised by recent Hollywood films and celebrity-backed campaigns. This has permitted the concepts of ‘conflict’ diamonds and ‘dirty’ gold to enter the public consciousness. But what about those other precious, and increasingly indispensable objects, found in our pockets and bags? The sad truth is that our mobile phones and other electronic gadgets contain materials that come at a hefty human and ecological cost. Thanks to a campaign led by a coalition of organisations, in which Catholic groups have played a central role, the link between digital products and human rights abuses has been exposed. Through public awareness-raising events, enabling affected communities to speak out, and by lobbying politicians, the coalition has succeeded in getting the European Union to introduce legislation to combat the trade of illegally mined metals. Many precious metals like tin, tungsten, and tantalum – vital for components used in electronic equipment – are mined in areas of the world affected by armed conflict. The Democratic Republic of Congo (DRC) is an example of a country that is incredibly rich in mineral deposits, but has been fought over by warring factions for decades. Whilst armed groups in the DRC do not mine the mineral themselves, they force local miners to hand them over for a fraction of the price that they fetch in the international market. The commodities eventually find their way into the international market, into products manufactures in other countries, before ending up on the shelves of our high street shops. A tragic reality is that international trade in minerals is helping finance human rights violations and accompanying environmental degradation in areas of the developing world. Consumers here in Britain often feel paralysed by such information. What can we do practically to avoid complicity with such injustice? Pope Francis’ encyclical on “our common home”, Laudato Si’, is a resource for engaging with this kind of dilemma. On the one hand it proposes radical solutions. Individually, the encyclical proposes an “ecological conversion” whereby we are to avoid getting caught in “a whirlwind of needless buying and spending” (§203). Pope Francis highlights the effectiveness of boycott campaigns, reminding us “purchasing is always a moral and not simply an economic act” (§206). On a macroeconomic level, the encyclical urges reform of systems to encourage less consumerist models of life (§112). On the other hand, Laudato Si’ encourages more subtle, incremental changes. In particular, Pope Francis encourages the work of civil society groups who engage with citizens and political institutions to promote the common good. This Laudato Si’ approach has inspired British Jesuits to engage in the fight against conflict mineral. Through three partner organisations: Jesuit Missions UK, the Brussels-based Jesuit European Social Centre (JESC), and the Spanish development charity ALBOAN, Jesuits in Britain have lent their weight to a campaign that resulted in the European Parliament passing a historic law earlier this year. The legislation requires companies to carry out investigations (known as “due diligence”) to ensure that imported minerals are not linked to conflict or human rights or ecological abuses. Whilst a regulation emanating from Brussels may seem very remote from what is going on in grass root communities both here in the UK and in the developing world, the Jesuits have tried to bridge the gap. 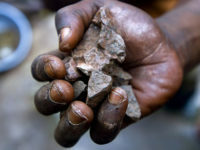 Taking advantage of our global reach, we have been able to connect the experiences of those directly harmed by conflict minerals with European organisations advocating for action. For example, drawing on the experience of its partners on the ground, Jesuit Missions lobbied key UK MEPs and the UK Government, urging them not to water down proposals when they discussed it with the European Commission. Online resources have been developed for schools designed to create awareness among young people about the connection between everyday objects and the problems associated with the exploitation of natural resources. Mobilising individuals via Facebook and Twitter campaigns has also been instrumental in pressurising policy-makers to support controls on conflict minerals. A central message of Laudato Si’ is the interrelatedness of our world. Just as humanity’s wellbeing is contingent on the health of the natural environment, so the (true) flourishing of economically affluent societies is dependent on respect for the human dignity of all. The conflict minerals trade is a good illustration of this integrated reality. The campaign, in which church groups have stood alongside secular organisations, is an example of how connecting various stakeholders can yield successful outcomes, and help combat a form of inaction which Laudato Si’ terms the “sin of indifference”. The recently adopted EU legislation on conflict minerals is far from perfect, and its effectiveness will hinge on how it is implemented. In a post-Brexit world, UK citizens and Church group will have an important role to ensure the UK Government honours, and indeed goes beyond, measures agreed at a European level. Originally published in the Caritas in Action column in the Catholic Times (UK) on 21st July 2017.